3/17/2019 They were the class of the field for the vast majority of the Mobil 1 Twelve Hours of Sebring Presented by Advance Auto Parts and the No. 31 Whelen Engineering Cadillac DPi-V.R team of Felipe Nasr, Pipo Derani and Eric Curran were rewarded with an overall victory in a grueling IMSA WeatherTech SportsCar Championship battle on Saturday. It wouldn't be an easy victory, though, as the No. 31 team had its hands full with the No. 10 Konica Minolta Cadillac DPi-V.R co-driven by Renger van der Zande, Matthieu Vaxiviere and Jordan Taylor over final two hours of the race. Taylor nearly got past immediately after a pit stop with an hour and 20 minutes remaining when Nasr took over the No. 31 from Derani, but on that occasion, Nasr eventually managed to pull away. Taylor wasn't done yet, though. He closed all the way up on Nasr with 21 minutes left in the race, getting to within 0.2 seconds, but still not quite close enough to make his move. "Jordan was already warmed up, he was in the car, and I got in the car knowing that he was going to be close," Nasr said. "From the time I jumped in the car, all the procedures getting the belts on the team stopped changing tires and go - and he was right there. "I couldn't do a little mistake today. It was all about hitting our marks and I did that from Lap 1 to the checkered flag. There were some pretty tricky moments out there, like I caught traffic a few times and I had a four-second lead, and that last yellow flag as well that came with four laps to go, man, that was really tricky. I could see they picked up their pace, but we got the job done first." It was the first Sebring victory for both Nasr and Curran - who together co-drove to both the 2018 WeatherTech Championship and the IMSA Michelin Endurance Cup Prototype titles. It was Derani's second consecutive Sebring victory and his third in four years, making him the first driver with three overall wins in four years since the legendary Phil Hill won in 1958, 1959 and 1961. "It means the world," Derani said. "Today was just one of those days where everything went perfect, but we had a lot to lose in the beginning with the rain at the beginning. Two and a half hours I was in the car and there was lot of stress because there's a lot to lose. You're thinking, ‘OK, there's 11 hours to go. What should you do? Push?' But in the end, everything worked perfectly thanks to this amazing team." Derani and Nasr will continue as full-season co-drivers in the No. 31, while Curran will rejoin the team for the next Michelin Endurance Cup round, the Sahlen's Six Hours of The Glen on June 30. "As a sports car driver, you kind of have your list of the races that you want to win on your bucket list, and the Sebring 12-hour is right up there at the top," Curran said. "I don't know how many years I've been racing the Sebring 12, but back to the ALMS days and obviously finishing second last year and finishing second prior to that, to come so close to a win, but not quite enough. So, it feels really special to now win this thing, finally, in a Whelen Cadillac." After winning both the 2018 season-ending Motul Petit Le Mans at Michelin Raceway Road Atlanta and the 2019 season-opening Rolex 24 At Daytona, the No. 10 team picked up its third consecutive podium with a runner-up result. They're now tied with the No. 31 team - which finished second at Daytona - in the DPi championship standings with 67 points apiece after two of 10 races. "We had a third-place car all day," Taylor said. "So, to finish second was good. I think we overshot what we were capable of, so leaving here with that, we should be proud of it. It's a good points day. We'd love to win Sebring, but I don't think it was worth making a huge risk at the end to lose a bunch of points, so I'm happy with second and we can move on to Long Beach." The No. 54 CORE autosport Nissan DPi of Jon Bennett, Colin Braun and Romain Dumas completed the top five. It was Nissan's second consecutive top-five at Sebring after winning the race last year with Derani, Johannes van Overbeek and Nicolas Lapierre in the No. 22 Tequila Patrón ESM entry. A seesaw battle in the early stages gave way to a dominating LMP2 class victory for the No. 38 Performance Tech Motorsports ORECA squad of Kyle Masson, Cameron Cassels and Andrew Evans. At two hours and 43 minutes into the race, Anders Fjorback slowed on course with left-side suspension problems on the Motul Pole Award-winning No. 52 PR1 Mathiasen Motorsports ORECA. The issues sent the No. 52 to the paddock for lengthy repairs, giving the No. 38 team an easy, 13-lap victory. It was the first Sebring victory for both Cassels and Evans, while it was the second for Masson, who also won in the Prototype Challenge (PC) class with the Performance Tech team back in 2017. "Today was a really hard 12 hours," Masson said. "Sebring is so bumpy. To get through the day with the car holding up completely, no mechanicals, it was a flawless execution. I'm just happy we brought the car home safe. "For me, the rain was something I prayed for. I love driving in it and I love racing in it. I showed that this morning. I perform well in it is maybe the reason I love driving in it. I brought our car up to sixth overall, and to be passing the pole-sitting Penske DPi was a great feeling. I was very calm and cool, and experience builds calmness in the car. It was a lot easier today than two years ago remaining level-headed throughout the day." Next up for the WeatherTech Championship is the 100-minute BUBBA burger Sports Car Grand Prix at Long Beach on Saturday, April 13. The race features only the DPi and GT Le Mans (GTLM) classes as part of the Acura Grand Prix of Long Beach event weekend. NBCSN will have live, flag-to-flag coverage of the race beginning at 5 p.m. ET. IMSA Radio also will cover the action live on IMSA.com, RadioLeMans.com and SiriusXM Radio. 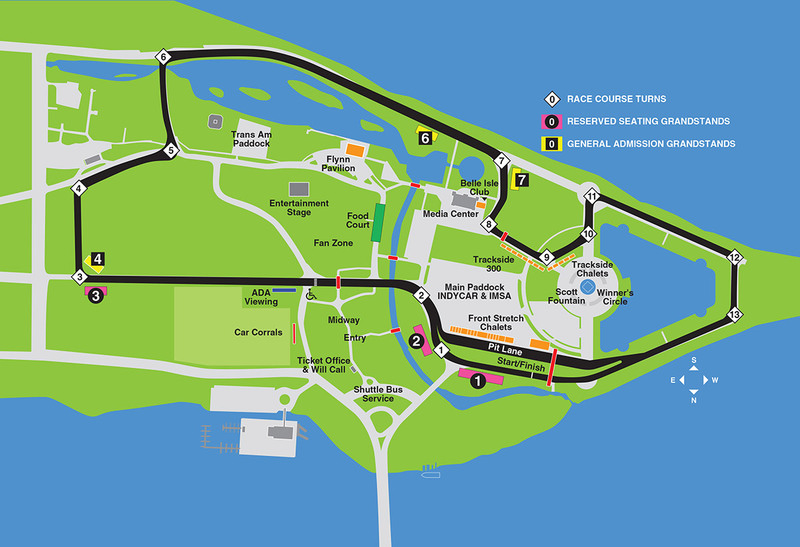 We are excited to host you at the Chevrolet Detroit Grand Prix presented by Lear. It promises to be an action-packed weekend - get your tickets now! The Chevrolet Detroit Grand Prix presented by Lear is a 501(c)3 organization and a subsidiary of the Downtown Detroit Partnership. Scheduled for May 31-June 2, 2019, the event will include the Chevrolet Dual in Detroit featuring the cars of the IndyCar Series, the Chevrolet Sports Car Classic with the exotic sports cars of the IMSA WeatherTech SportsCar Championship and the Trans Am Series presented by Pirelli. Partners for the 2019 Grand Prix include General Motors and Lear Corporation.